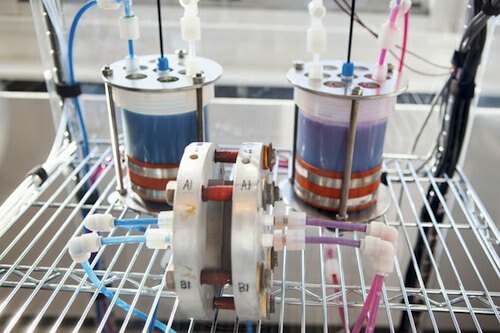 Harvard University researchers have invented an new kind of “flow battery” that could be used on large-scales, such as within electricity grids, to store intermittent renewable energy from sources such as wind and solar. The research describing the new “metal free organic-inorganic aqueous flow battery”, was published in the journal Nature on 9 January. To create the battery, the Harvard researchers say they have been working with a previously overlooked group of organic compounds called quinones. These can be used to make inexpensive batteries that can charge and discharge renewable energy more quickly than current batteries are able to. The researchers maintain that their new battery can work as well as existing batteries with chemistries based on metals, which are far more expensive to make. The new battery does not use a precious metal catalyst, it’s underlying chemistry is metal-free; instead, it uses the naturally abundant quinones. Quinones are water-soluble compounds that store energy in plants and animals. They are found in all green vegetables, and the molecule the researchers used is almost identical to the one in rhubarb. Because quinones are naturally abundant and water-soluble, large, inexpensive tanks could be set up to store electricity, rather than using the traditional, and more expensive solid-state batteries. This is all good news for the future of renewable energy storage. If we are serious about eventually using a large proportion of renewable energy in the world’s energy mix, then developing inexpensive, large-scale renewable energy storage will be absolutely necessary.